Diana Palace Hotel Free Child Places Agassi Zante Low Deposit Family Holidays @Web2travel Deals. Online Since 2000. Finding the Best Value Holidays to Zante from UK airports. 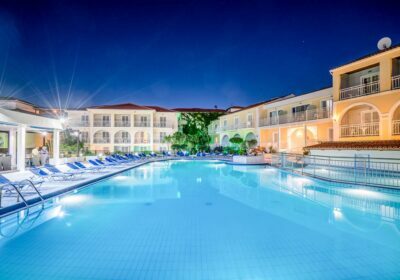 The 4 star Diana Palace Hotel, Argassi, Zante is one of the top rated hotels in Argassi. Guests like the comfortable accommodation and a relaxing environment. Just 5 minutes from the beach and only 6km from Zante town. Ideal for families. Clean and comfortable rooms, friendly staff. Very good food and plenty of variety for an all inclusive holiday. Claim your Free Child Place for Diana Palace Hotel Agassi Zante. The hotel consists of 120 guest rooms and all benefit from individually controlled air conditioning (seasonally operated and payable locally) , direct dial telephone, Wifi internet access, mini-fridge, ensuite bathroom, TV (remote upon request), hairdryer, wake up service and a balcony or terrace. Studios and apartments feature fully equipped kitchenette with kettle, toaster and microwave. Facilities at the hotel include an outdoor swimming pool with childrens section, snack bar, buffet restaurant, two bars, TV lounge with large screen satellite TV, fitness centre, massage/reflexology, childrens playground, pool table and arcade games. The hotel also offers an animation programme. Hotel services offered are 24hr reception, safe deposit box rental, currency exchange, Wifi internet access and parking.